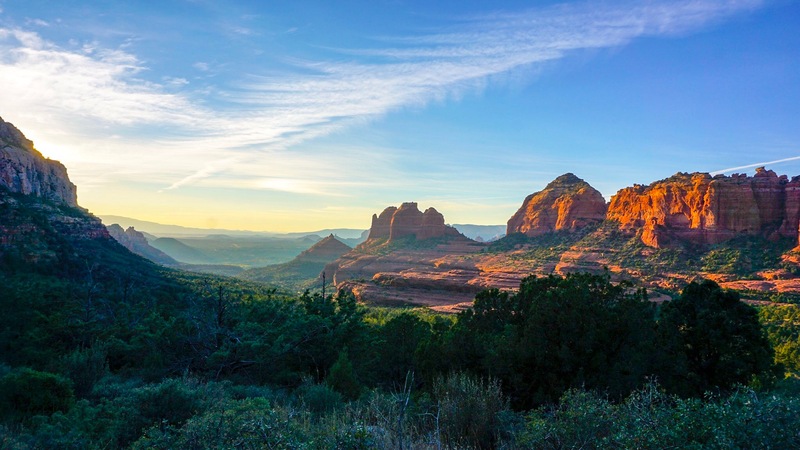 Sedona is just a few hours north of Phoenix but looks dramatically different. 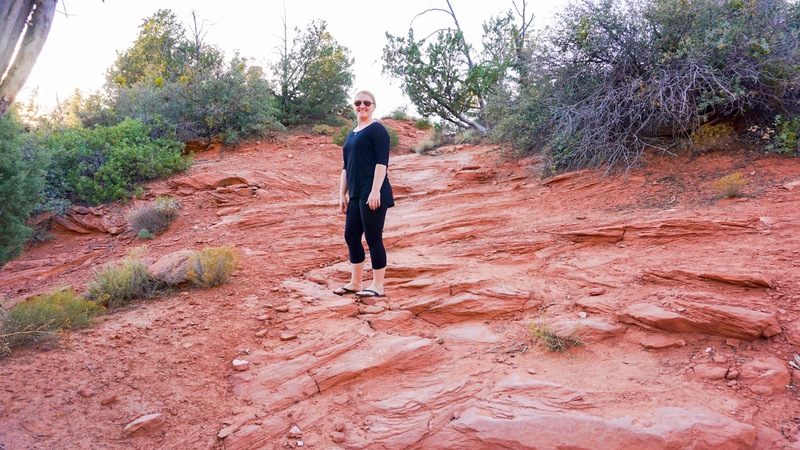 The flat, tan desert of the south transitions to the deep red canyons of the north, making for fantastic views, excellent hiking, and even a few Jeep trails. Brandon remembers visiting this area when he was a kid and wanted to show me that Arizona is not entirely flat and tan. We stayed at a Thousand Trails campground in the nearby town of Cottonwood, which was a great starting point for visiting the area. 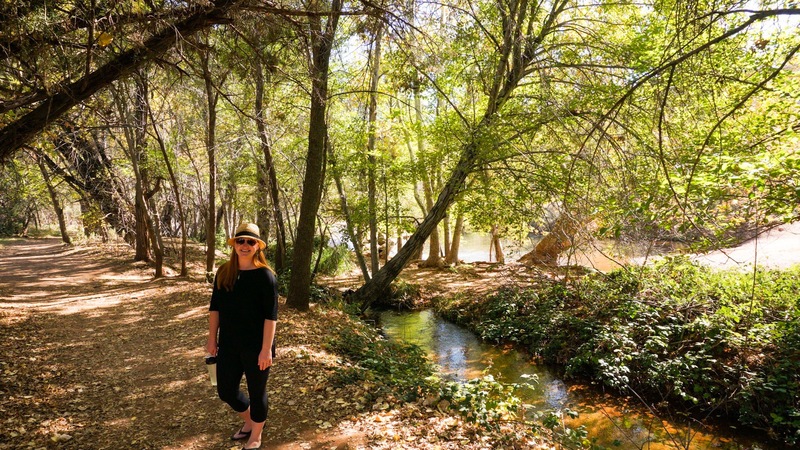 Cottonwood was quiet and peaceful (not nearly the tourist draw of Sedona) but was large enough to have all the stores and services we needed (including a Kroger, our favorite grocery store chain). 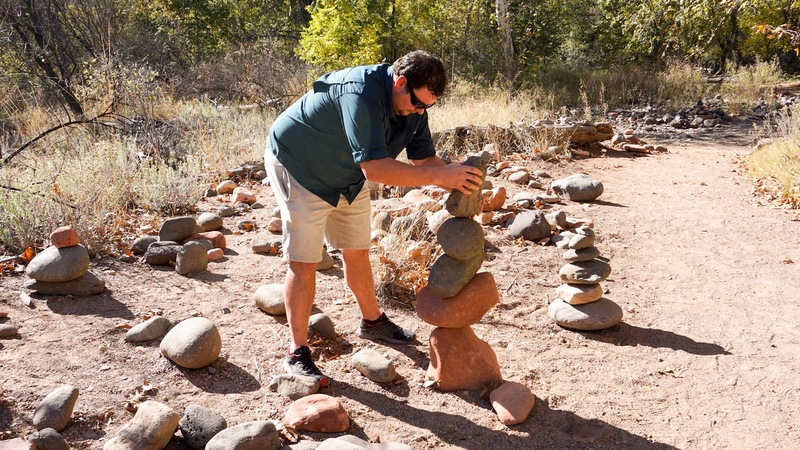 We only had two days in the Sedona area, and this stop had been Brandon’s idea, so I let him plan our itinerary. It was a nice change of pace having someone else do all the planning. 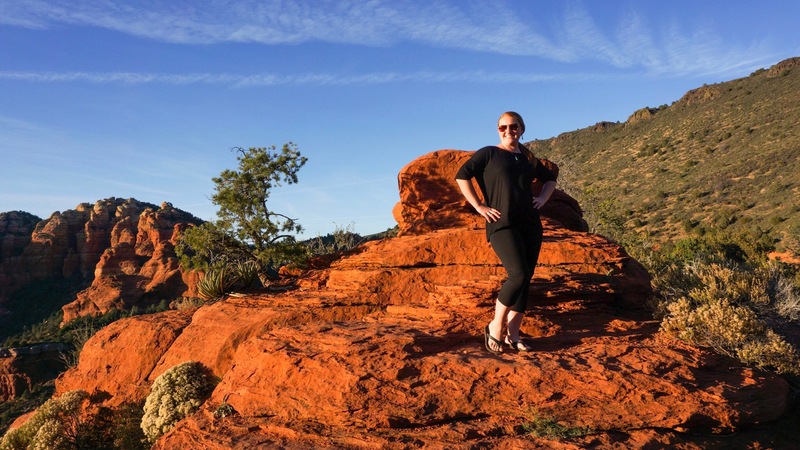 Day 1 covered all the best parts of Sedona. We went shopping, hiking, had a picnic at a park, and drove up through the canyon on a Jeep road to watch the sunset. 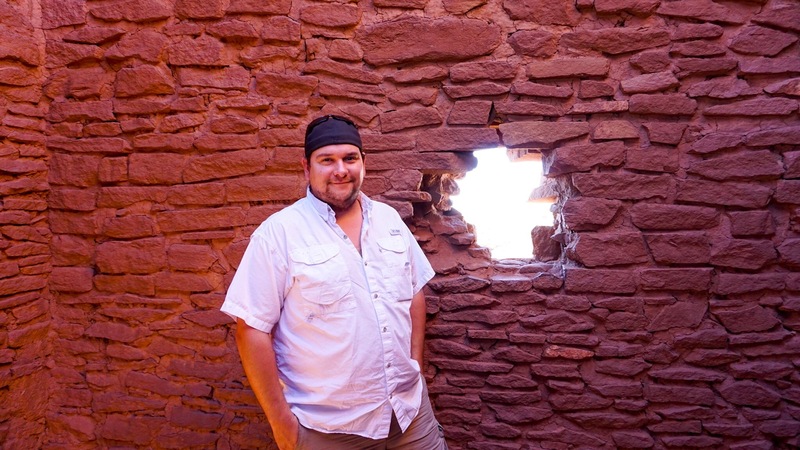 Day 2 was a tour of some Native American ruins and cliff dwellings outside of Flagstaff. This was not actually where Brandon had intended to take me, but I’ll get to that later. We started the day by driving from one end of town to the other to get a feel for the area. 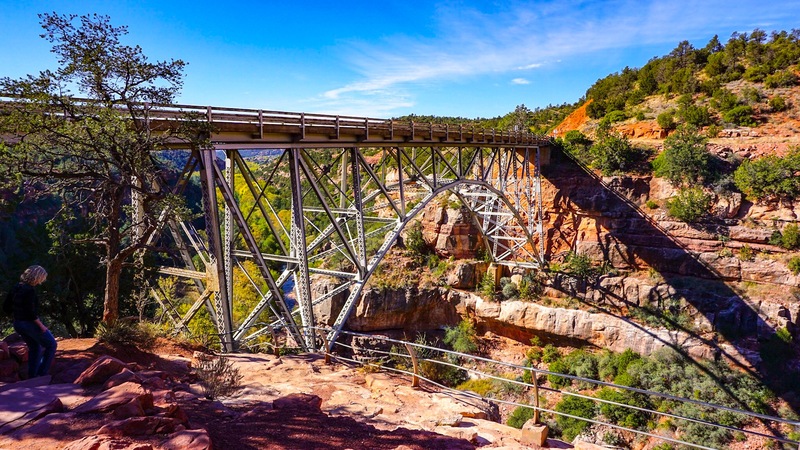 On the north end of town we stopped at this gorgeous bridge with a view of the Verde River below. 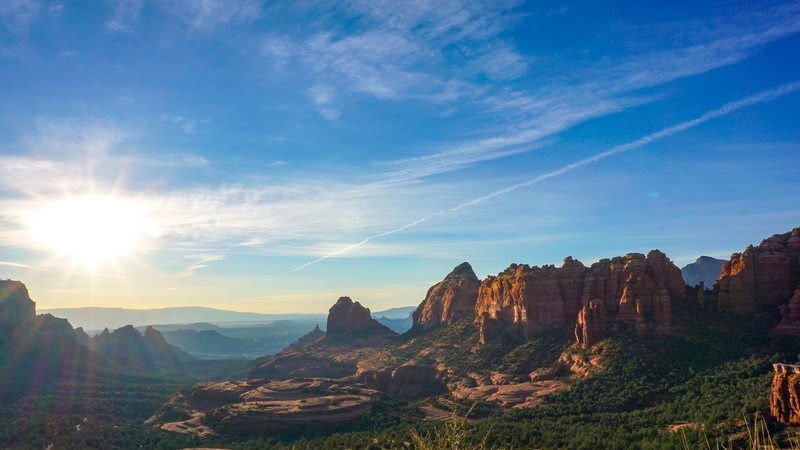 Sedona is an artsy tourist town with a distinct new-age vibe mixed in with its Mexican heritage. 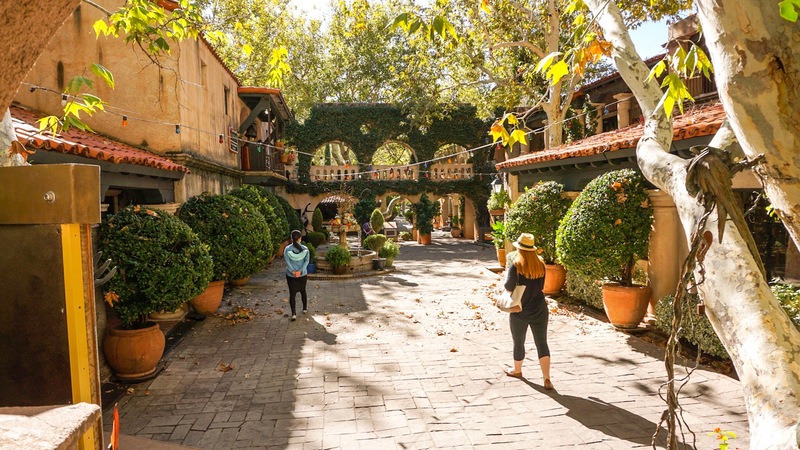 The main drag is lined with a mix of T-shirt shops, Jeep tour companies, and rock shops that also offer psychic readings, crystal healing and the like. Just across town you can do a bit of upscale art shopping (or browsing) at the Tlaquepaque, a unique shopping center designed to look like an old Mexican village. 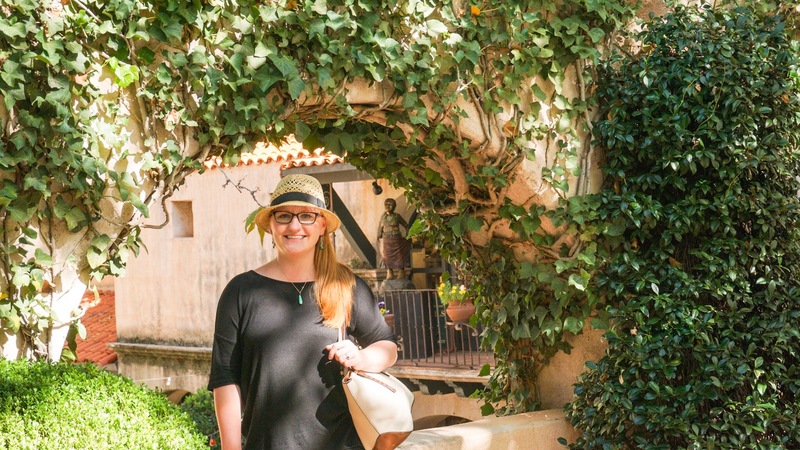 We really enjoyed the Tlaquepaque. 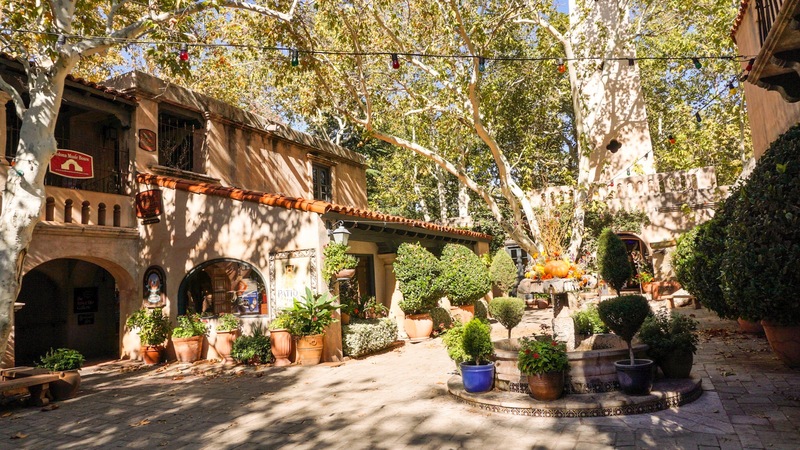 The old-world design of the village make it a great place to browse and just enjoy the experience. 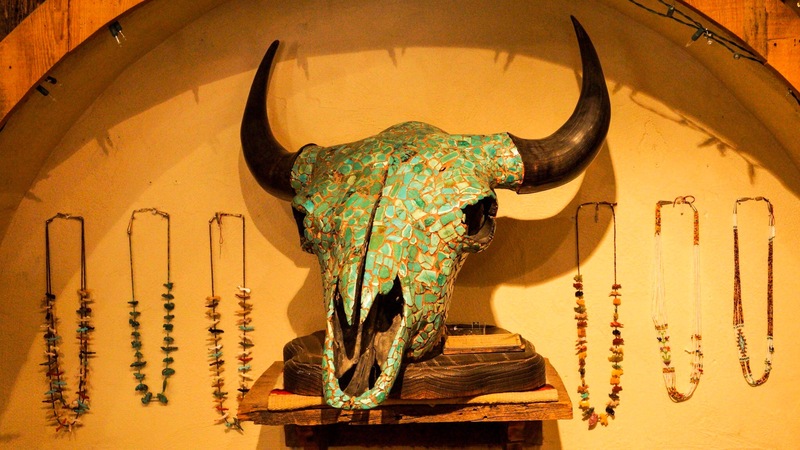 Most of the stores sell art, crafts, and jewelry made by local artists. Much of it was very high-end and expensive but that doesn’t make it any less fun to wander through and window shop. I did end up finding a new pair of earings in one shop that I just love. They are made of fire coral and look just like a pair my mom has that I always find myself borrowing when I visit. Score! I was surprised to learn that these buildings are not actually that old. The plaza was designed and constructed in the 1970s by a local man who envisioned it as a place for artists and community gatherings. He wanted to make the space feel old and organically constructed so he only hired amature plasterers and masons and gave them significant personal freedom in how to complete their work. The end result looks as if it were built by many different people over a long period of time, just like an actual village would have been. 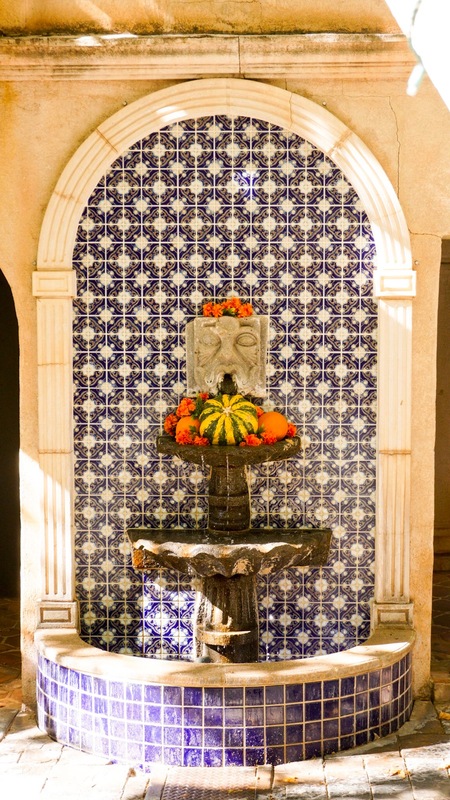 The many statues placed around the courtyard add charm and are great exposure for local artists. The statue of the mama mountain lion carrying her cub was my favorite. We were super tempted by the smell of fresh tortillas emanating from the Mexican restaurant at the far end of the plaza but we had packed a picnic lunch and had plans to enjoy it at a nearby park Brandon had picked out. 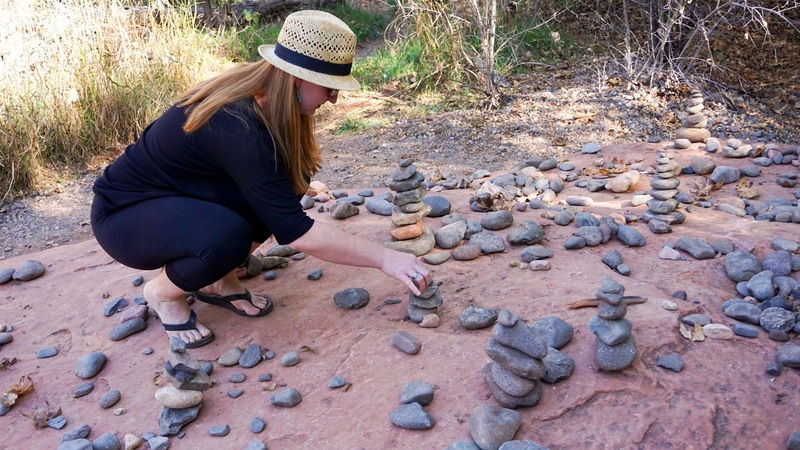 The Crescent Moon Picnic Area is just outside of town and was a perfect mid-day break from the touristy parts of Sedona. 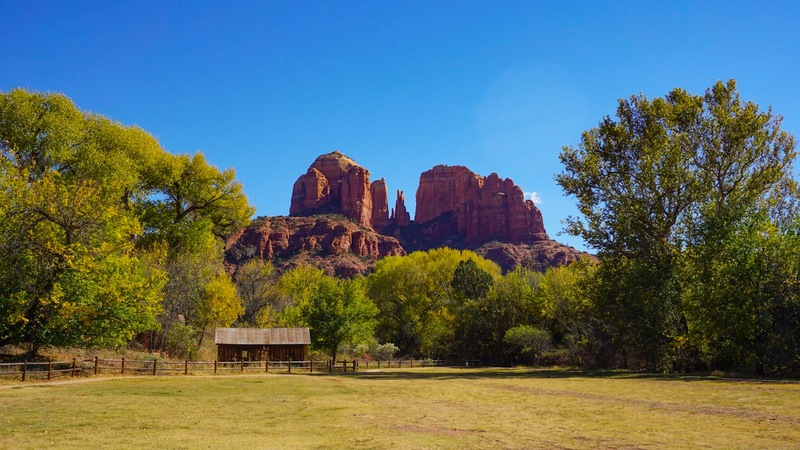 The picnic area is next to a picturesque tree-lined creek beneath towering Cathedral Rock, reportedly one of the most photographed rock formations in the southwest. The park was full of birds I couldn’t identify and curious little squirrels. I know that you are not supposed to feed the wildlife, but I will say that the squirrels were big fans of the ranch-flavored corn nuts I spilled. After lunch we went for a walk along the banks of the creek. There were trails on both sides and lots of people out enjoying the pleasant weather. This appears to be a popular place for the locals to take their dogs. The water is mostly shallow (but very cold). Perfect for splashing around or chasing a ball. I know our dog Rudy would love it here. We followed a trail along the edge of the creek for at least a mile, expecting to find a bridge that would connect the trail to the one on the other side. We never found a bridge and no one we asked knew whether the two trails ever connected. I suspect the trails may be less “official” trails and more just trails made by the people, for the people. We also never saw any trail markers. 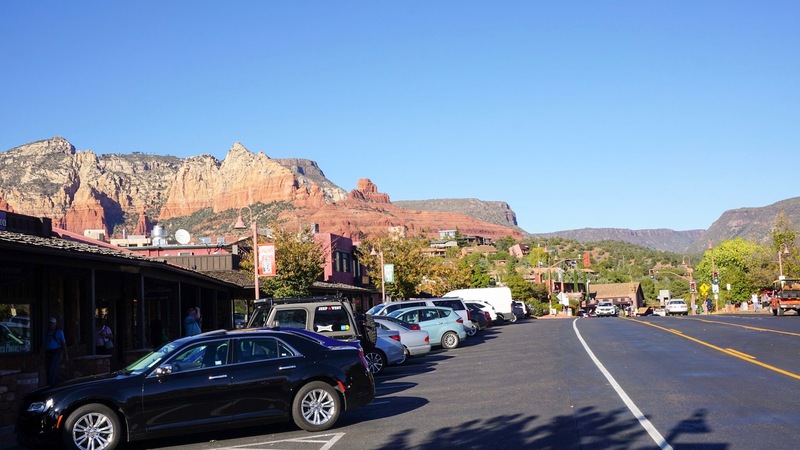 Back in town, we parked on the main drag in Sedona to check out some of the shops. 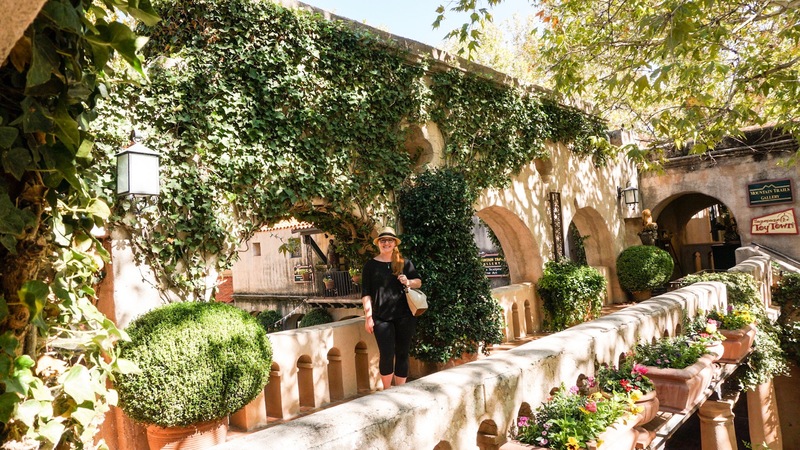 While the Tlaquepaque is mostly focused on the area’s Mexican heritage, this shopping district plays up Sedona’s history with wild west western movies and the metaphysical. Lots of cowboy hats and fridge-covered leather jackets for sale. And once properly attired you could stop by one of the many shops selling crystals and geodes before having a psychic reading or raiki healing session. We aren’t really into the new-age stuff, but wandered through some of those shops anyway to have a look at the gorgeous rocks for sale. This little tow-truck is actually a Jeep. It is a Forward Control or FC that has been modified with a towing system. The FC was only produced from 1956 to 1965. Brandon recognized what it was right away and pulled over to take pictures of it. He really just can’t help himself when it comes to cool old cars. The last activity Brandon planned for the day was a drive up Schnebly Hill Road to get some photos of the sunset from the canyon overlooking town. Schnebly Hill is a real road and not technically a 4X4 trail but the condition of the road was like many off-road trails we’ve been on. The only people driving beyond the parking area were either in Jeeps or ATVs. 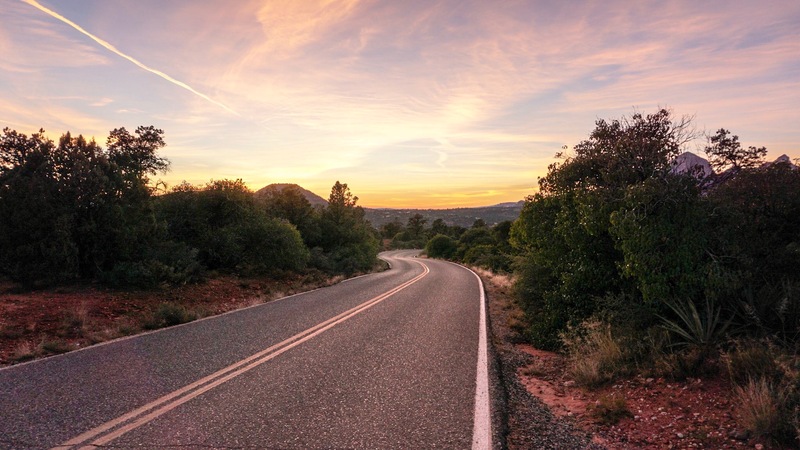 The rocky unpaved road continues from outside of Sedona for 13 miles until it intersects with Interstate 17 on the way to Flagstaff. We only drove the first five miles up to an excellent viewpoint of the canyon and surrounding rock formations. Schnebly Hill Road appeared to be one of the main routes for the local Jeep tours. Nearly every other vehicle we saw was a cupcake colored Jeep from the local outfit, Pink Jeep Tours. We had stopped and talked with these guys while we were walking around downtown and easily recognized the pink Jeeps. They are big business in town with a kiosk on nearly every block. 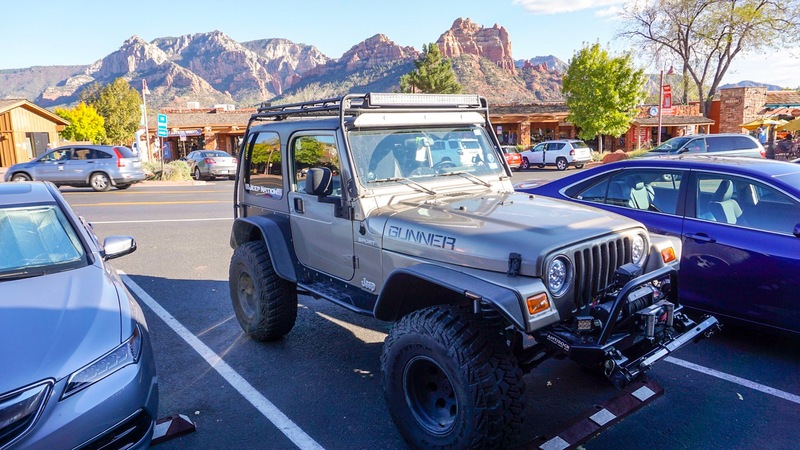 They have painted all 80 Jeeps in their fleet Barbie doll pink and take tourists on tours of the surrounding red rock country. 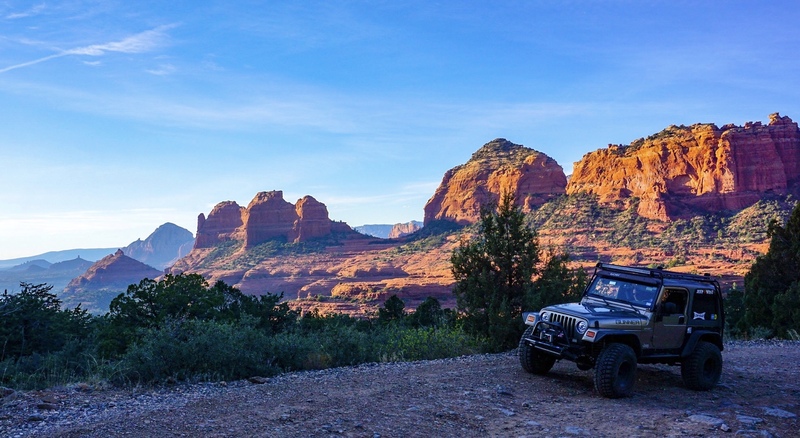 Tours range from an easy scenic ride to much more intense rock-crawling adventures. Plus, they have modified all of the Jeeps with raised safari-style seating so that you have a great view from every seat. 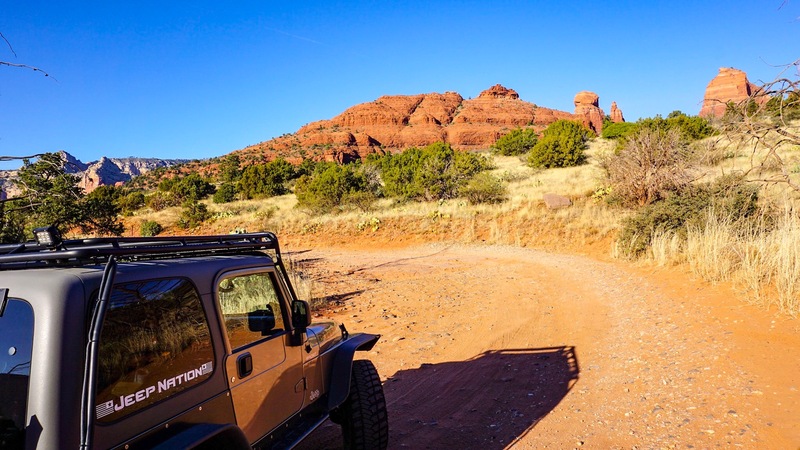 We didn’t take one of their tours because we have our very own awesome Jeep, but check them out at the link above if you plan to visit Sedona sans-Jeep. There are mile markers along the trail but they are not particularly easy to spot. However, you will know you’ve found the right place when you see a dirt parking area on the left, right before a gate. If you continue beyond the gate you can drive all the way to Interstate 17. 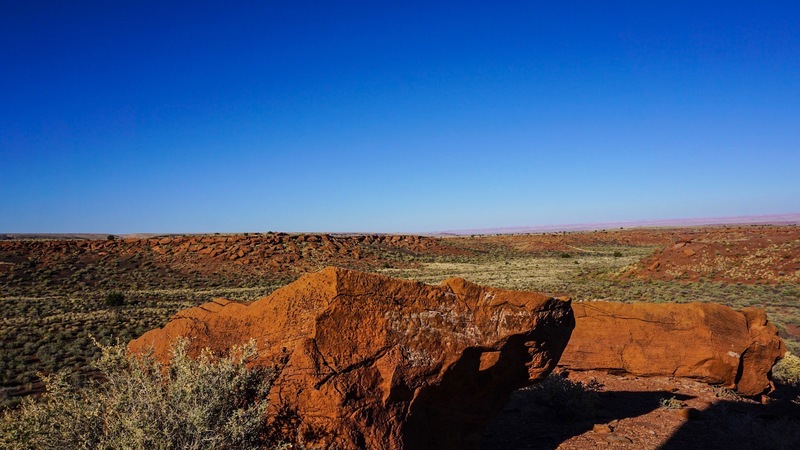 Look for a trail directly beyond the parking area and climb up to the top of the rocky outcrop. The view is incredible, but don’t expect to have it all to yourself. This is a very popular stop along the trail. Nearly all the Jeep tours come by here. 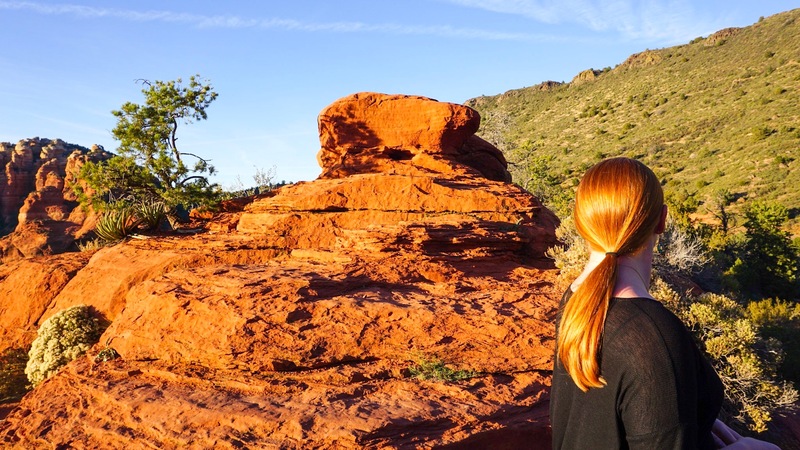 Brandon thought my hair matched the red rock perfectly. Like I said, the view from the top was pretty damn majestic. It was like we had been transported back to the time of the dinosaurs, the land before time. 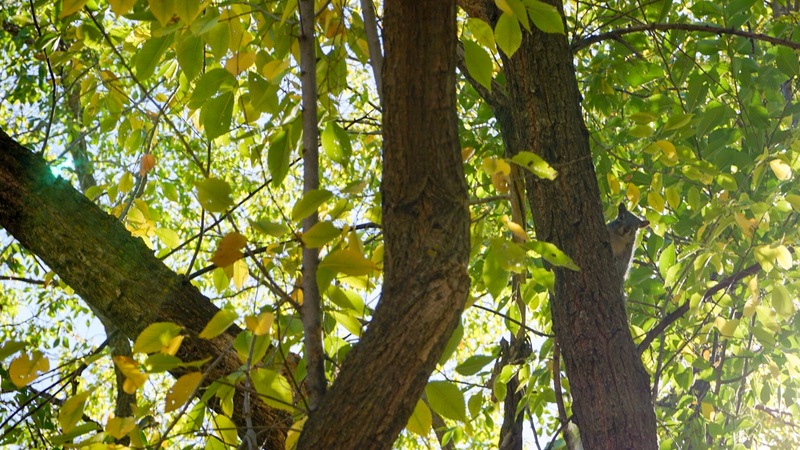 We might see a Brontosaurus munching on some tree tops or a pterydctal fly by at any moment. I highly recommend timing this drive with sunset. The setting sun shining onto the canyon walls in the east really brings out their red color. Actually, the five-mile drive back to the paved parking area took much longer on the way home because we kept stopping to take more photos! 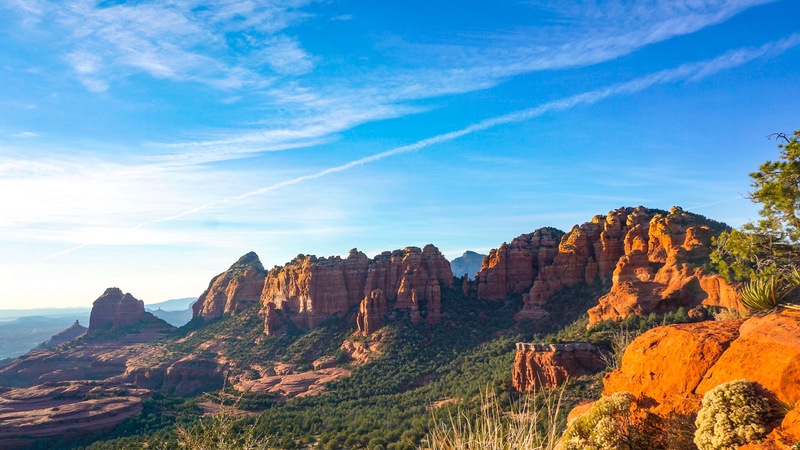 You can find formations of red rock all over northern Arizona, but we didn’t see any that were as striking as those in Sedona. I feel that this is partially because of the contrasting green you find here. This is still a desert but the Verde River running through Sedona supports an amazing amount of plant life. 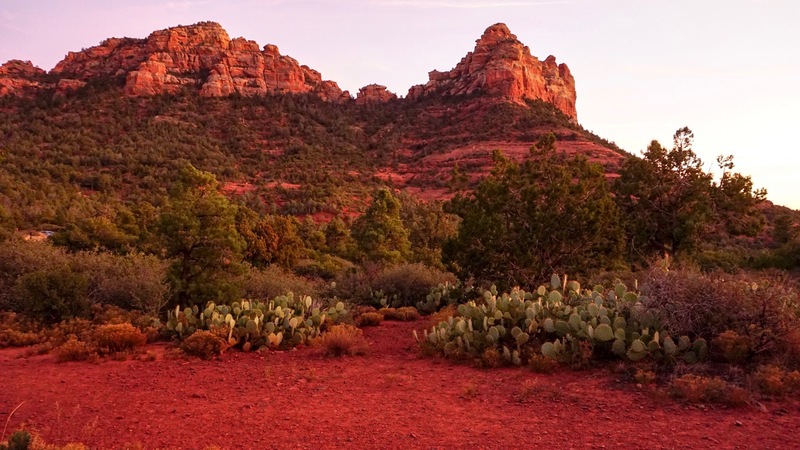 The contrast between the lush greenery and the red mountains make each just a bit more dramatic and lovely. Back at the parking area I had plenty of time to take pictures of the sunset while Brandon aired up our tires. 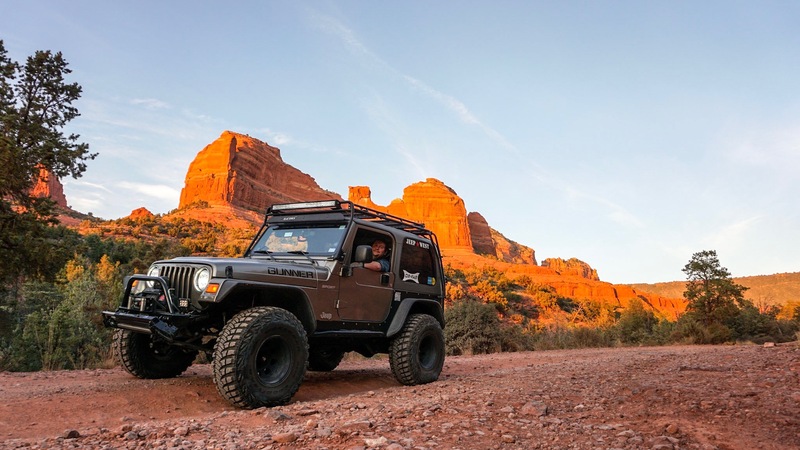 We often reduce the air pressure in the Jeep tires when driving off-road both for ride quality and traction. On pavement, for example, we keep the tires at 22 psi in the front and 26 psi in the rear. On Schnebly Hill Road we reduced all of the tires to 10 psi. On this type of terrain (a very bumpy rocky road) it isn’t really necessary but makes for a less jarring ride if you have slightly squishy tires. We noticed that none of the Pink Jeep Tour vehicles had aired down for Schnebly Hill. The passengers were bouncing around more than we like to, but maybe that’s part of the fun. When crawling around on large rocks airing down is required. It provides the traction needed to get up and over the rocks and might save you from a tire blow out if you land on a sharp rock too hard. We learned this lesson the hard way on our first trip to Browns Camp in Oregon. After that trip we purchased a small air compressor that now lives in the back of the Jeep just for this purpose. After a practically perfect day in Sedona I had absolutely no qualms about following Brandon’s lead for the next day’s tour. He can plan our day anytime. Brandon was super excited to show me a place called Walnut Canyon. His dad took him there when he was a kid and he remembered it being supremely awesome. 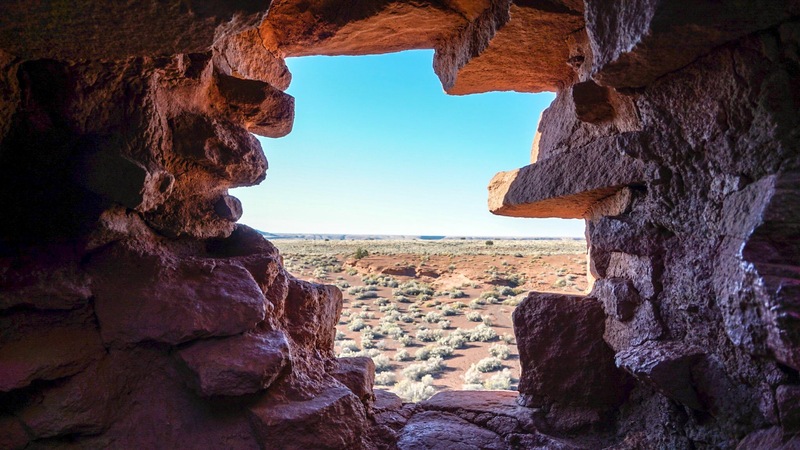 While we were visiting with his dad last week they both reminisced about the beautiful winding road through the colorful canyon (one of top scenic drives in the country) and viewing the distant cliff dwellings through binoculars. Unfortunately, the place Mike and Brandon were reminiscing about was not actually called Walnut Canyon and it was not just outside of Flagstaff. 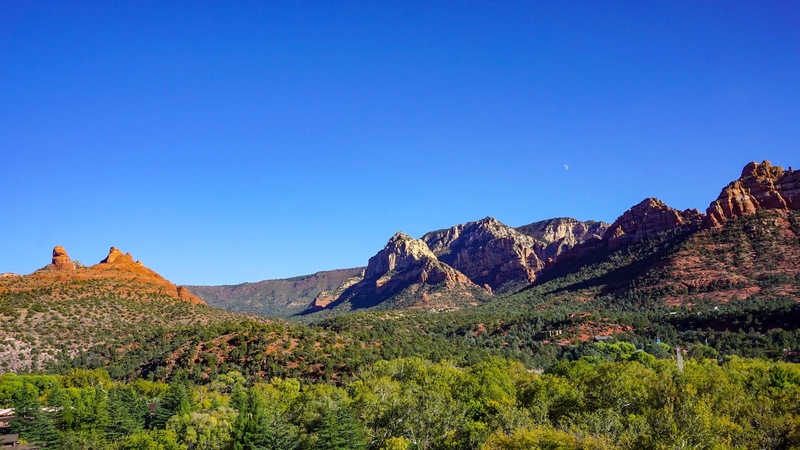 They were actually thinking of a place called Oak Creek Canyon, just on the other side of Sedona. (They are both canyons named after trees that happen to have cliff dwellings, so I can see the point of confusion.) 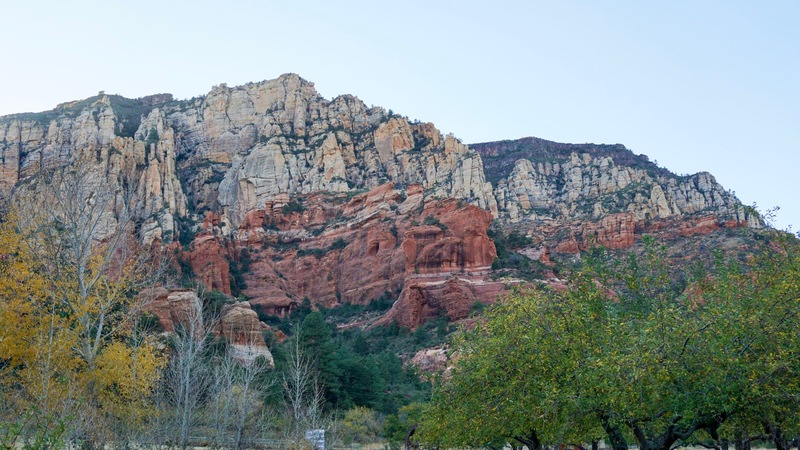 We had actually been a stones throw away from Oak Creek Canyon when we stopped at the bridge viewpoint the day before and had no idea. So instead of just driving a few minutes outside of Sedona, we went on an all day pilgrimage to the entirely wrong place. But travel is about exploration and adventure, not certainty, and it all worked out in the end. We even managed to stumble across the real Oak Creek Canyon before sundown on our way home. 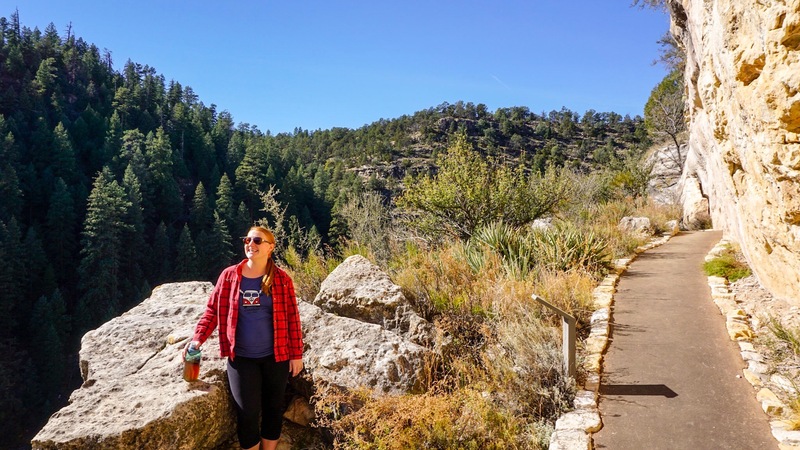 We started our day by driving about an hour north of camp to Walnut Canyon National Monument, outside of Flagstaff. It didn’t take long for Brandon to begin murmuring that this didn’t look like the right place. To begin with, there was definitely not a road running through the canyon and he specifically remembered this being a driving tour. But we were already there and I thought that walking down the short nature trail might jog his memory. Perhaps he was mixing two different places into one memory. 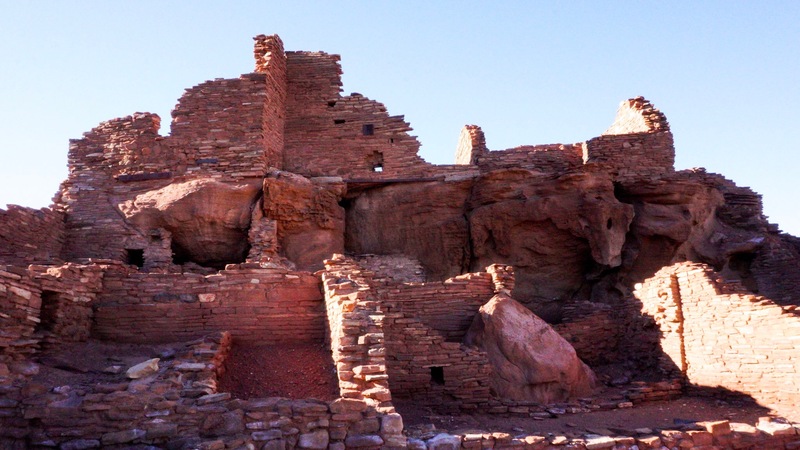 Afterall, this was a national monument created to preserve a group of cliff dwellings, just like he remembered. Walnut Canyon National Monument preserves what is left of the cliff dwellings of the Sinagua people (Spanish for “without water”). Not much is known about this group of native people. 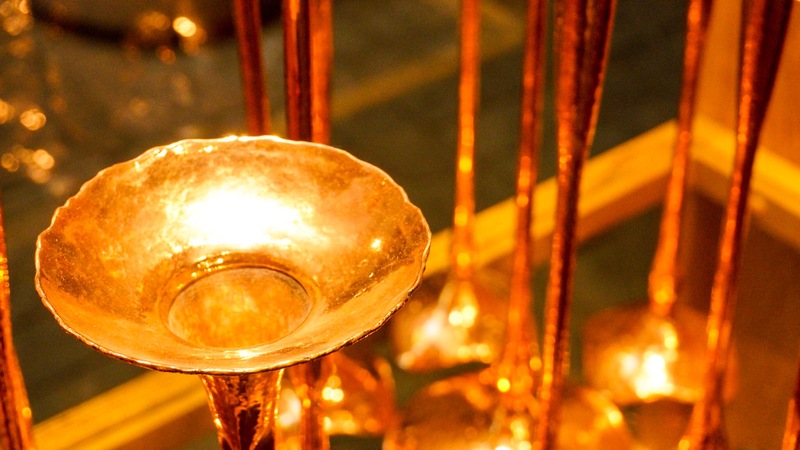 They were given the name Sinagua after-the-fact, in tribute to their ability to build a life in such an arid region. 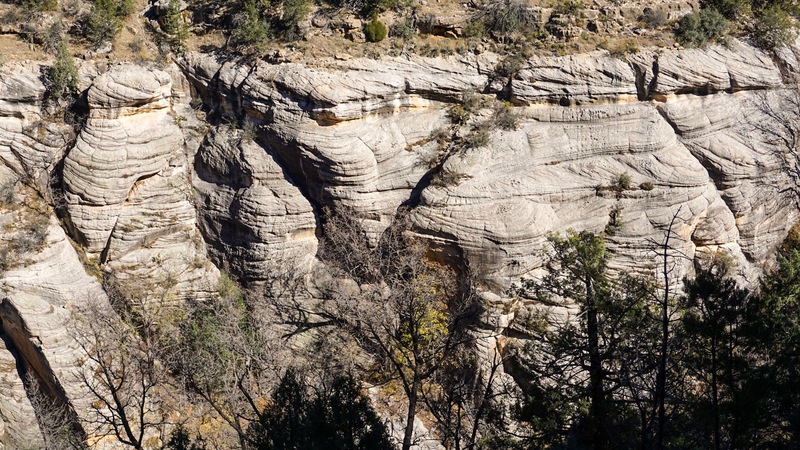 The Sinagua are Walnut Canyon’s only known permanent residents. 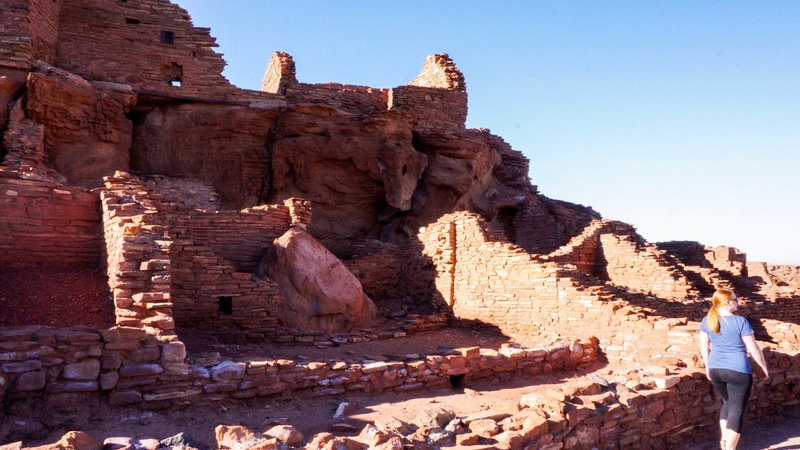 They built and lived in these cliff dwellings between 1125 and 1250, a relatively short period of time. 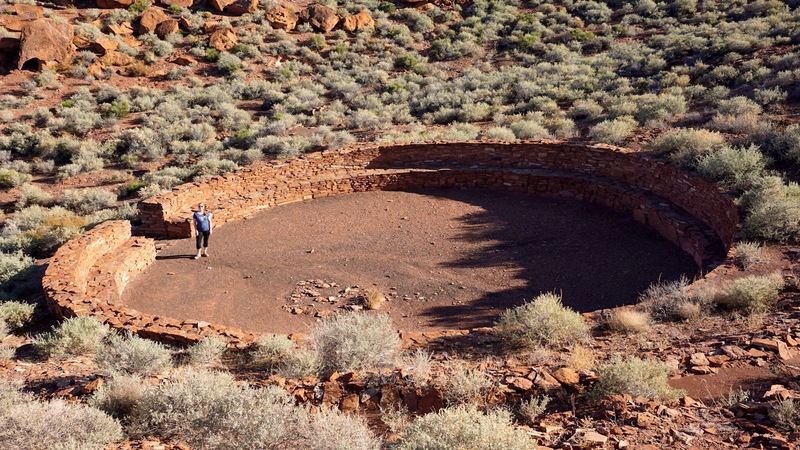 They also farmed the land at the top of the canyon and gathered water from the seasonal creek on the canyon floor. 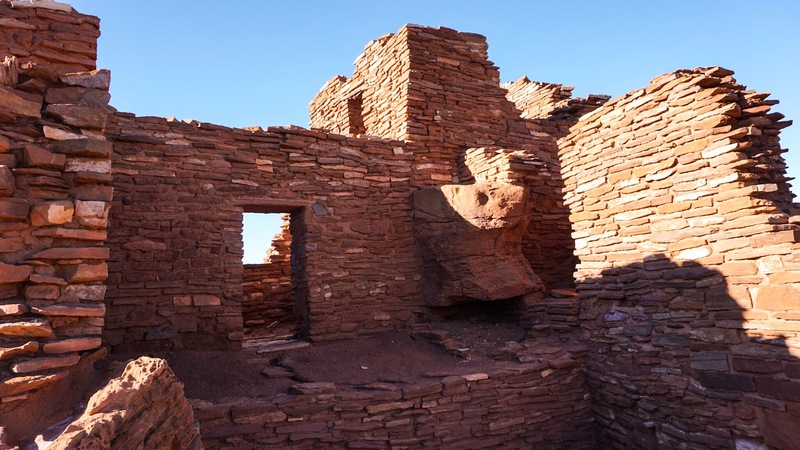 But after a little more than 100 years the Sinagua abandoned the settlement for unknown reasons. 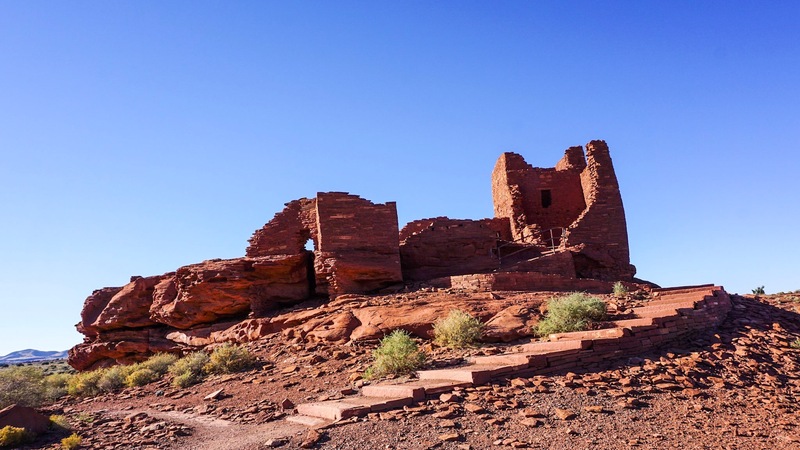 Researchers and historians generally believe that they assimilated into the nearby Hopi tribes. We walked the Island Trail, which is only a mile long but climbs down and back up 185-feet (240 steps) to the visitor center. If that sounds like too many steps for you, I encourage you to give it a try anyway. There are lots of benches to stop and rest along the way and the tour was very interesting. Once you’ve climbed down all 240 of those steps the path takes you past 25 different rooms built into the cliff. If you look very closely you can see a bead of silicone drawn along the rock face. The park staff uses lines of silicone to divert water running over the edge of the cliff, preventing further erosion and damage to the dwellings. Unfortunatly, most of the damage to the dwellings was done by people (not nature) during the 19th century. 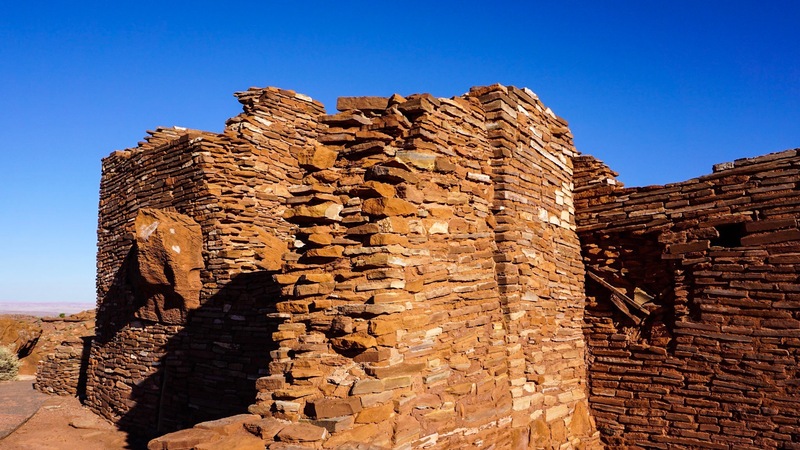 These ruins suffered from archeological tourism and souvenir hunting, much like Casa Grande in southern Arizona. 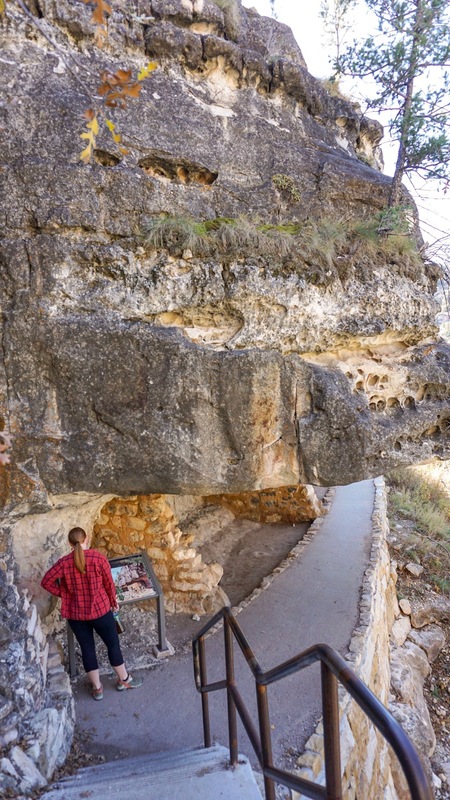 In some areas the early tourists actually blasted the cliffs with dynamite to remove the exterior walls of the dwelling to provide more light by which to scavenge for ancient pottery and jewelry. Pro Tip: Always read the interpretive displays. It’s not nerdy, it’s educational! While at the Walnut Canyon visitor center we had a look at a map of the area. 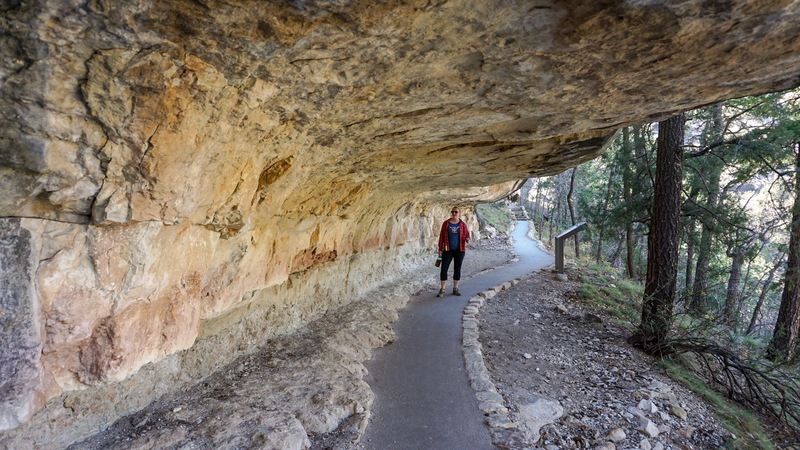 Walnut Canyon is actually the first of three national monuments along a scenic drive through the area. 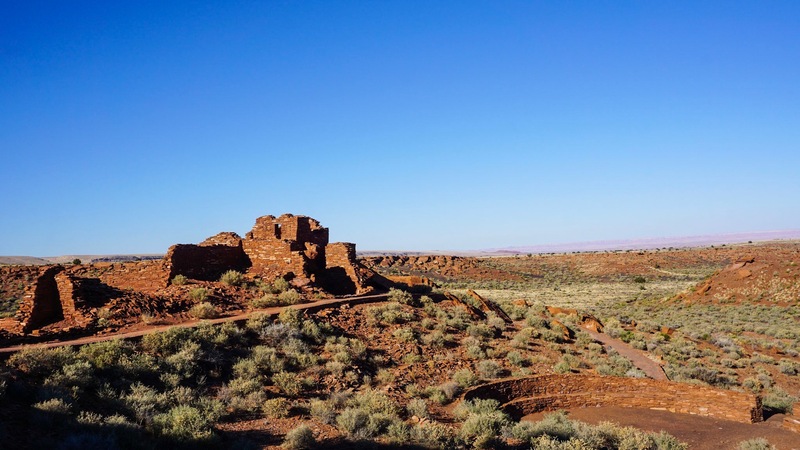 If we continued further we would pass the Sunset Crater Volcano and the Wupatki National Monument, another site of Native American ruins. At this point we were pretty positive that we were in the wrong place because nothing looked or sounded familiar to Brandon. However, we also had no idea where to find the place he was looking for and the next best thing was to just continue down the path we had started. For all we knew, he could be remembering a place from an entirely different family vacation in an entirely different state. We drove by the Sunset Crater Volcano but didn’t spent much time looking around. Funny enough, the area looked almost exactly like Bend, Oregon, a town we visited on our way south. I’m always amazed that two places thousands of miles apart can look so similar. But geologically, it makes sense. Both areas are high elevation deserts that were affected by large volcanic eruptions. 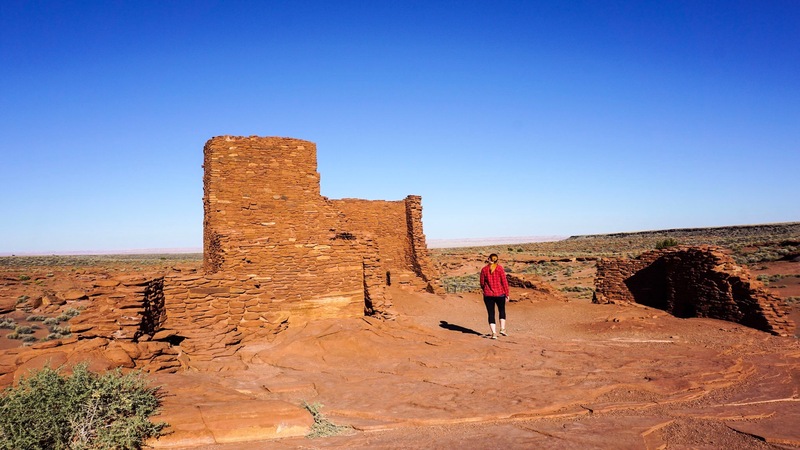 We did, however, take the short detour to see the Wukoki Pueblo. This was one of the stranger Native American ruins I’ve seen. The multi-story building was all alone on a hill in the middle of open desert. You could literally see for miles. Researchers don’t actually know what this particular building was used for. It could have been a single family dwelling, possibly a sort of castle for a prominent family. Personally, I think it was a look-out tower. The first line of defense against enemy invaders. 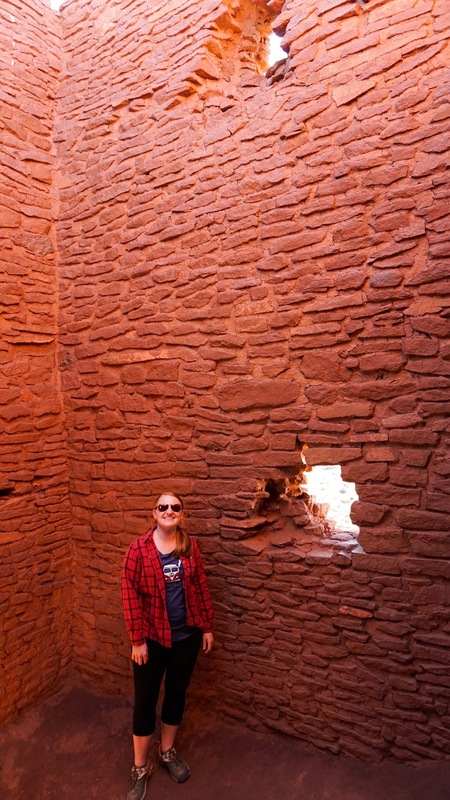 If you crawled through two tiny doorways (all of the doorways at these ruins were tiny) you could get inside the tower. From inside we could look out of the windows onto the desert below (the windows may or may not have been original to the structure). We could also see remnants of horizontal posts in the rock, possibly all that remains of a second floor loft. 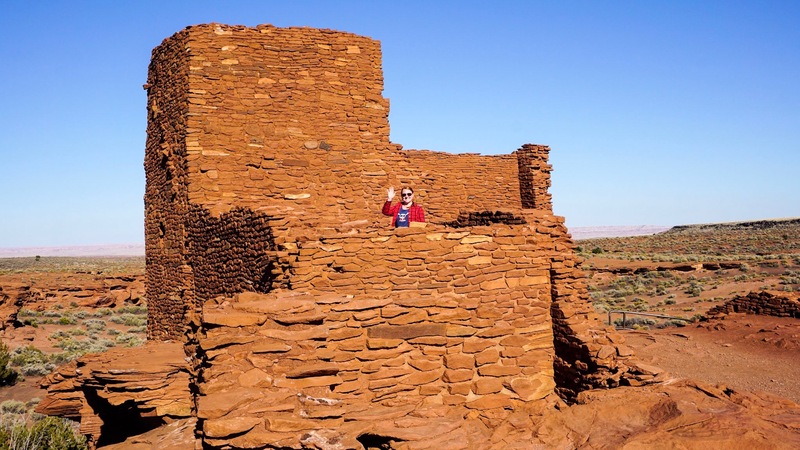 The last stop on our trio of ruins was the Wupatki Pueblo, only a few miles away from the Wukoki “castle”. 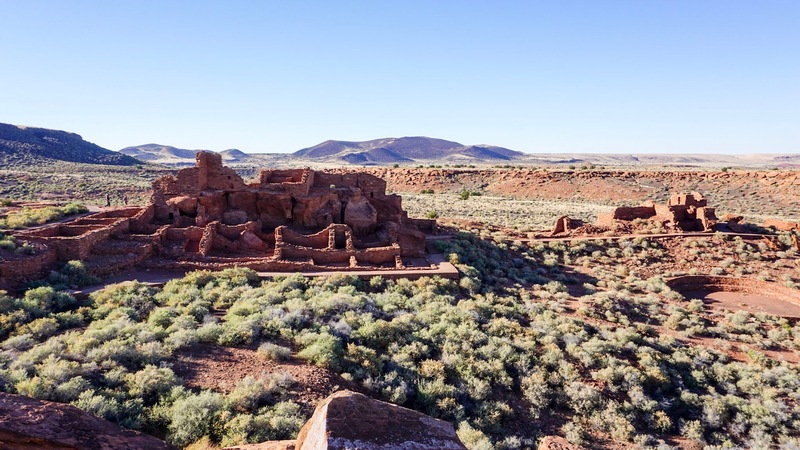 Unlike the castle, the Wupatki Pueblo was an entire village, complete with a sports arena! The villagers here lived a very communal life. The main living area was almost like a high-rise apartment with multiple stories and over 100 rooms. 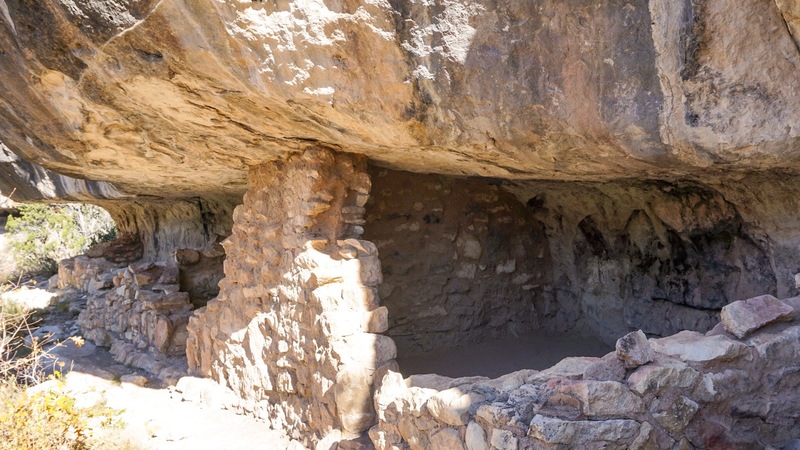 The people likely traded with the group from nearby Walnut Canyon. Both villages were built around 1100 and essentially abandoned by 1250. 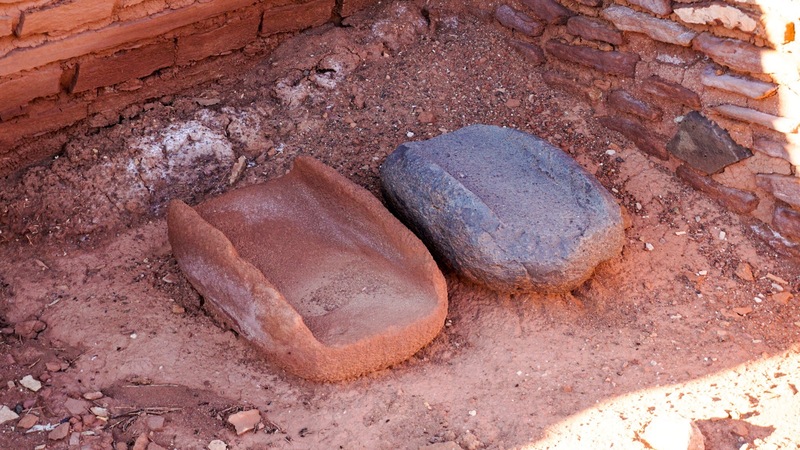 These flattened stones were used to grind corn and other grains into flour for bread. The doorway seen in this photo is actually an interior doorway. Most of these buildings did not have any exterior doorways because you entered the house through a hole in the roof. Of course, all of the ladders are now gone, but they used to lean up against the exterior of the house for easy entry and exit. The ladders could also easily be brought inside if the villagers were trying to keep someone out, perhaps invaders from another village. After we left the Pueblo and made it back onto the main highway, we decided to try to figure out where Brandon had been trying to take me in the first place. I think I googled something very simple like “scenic drive northern Arizona” and there it was. 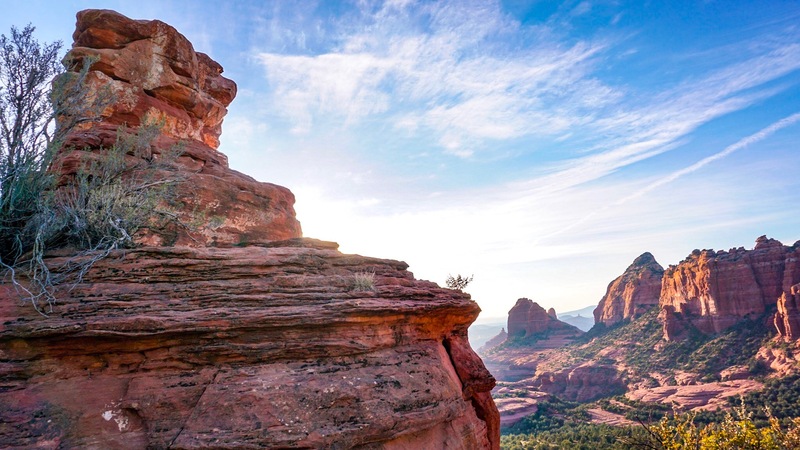 Oak Creek Canyon was the first result and was without a doubt the place Brandon had been describing. It had been right under our noses the whole time. Luckily, we could easily re-route our drive home to go straight through the canyon. We didn’t take many photos of the drive, partially because we were tired after driving and walking so many miles that day and partially because there were very few places to pull over along the curvy canyon road. But it was spectacular. The trees were full of fall color that looked beautiful against the canyon walls and at the bottom was a creek full of perfectly clear water. One of the many vacation cabins would make for a perfect weekend getaway. In the end it was one of those happy accidents. 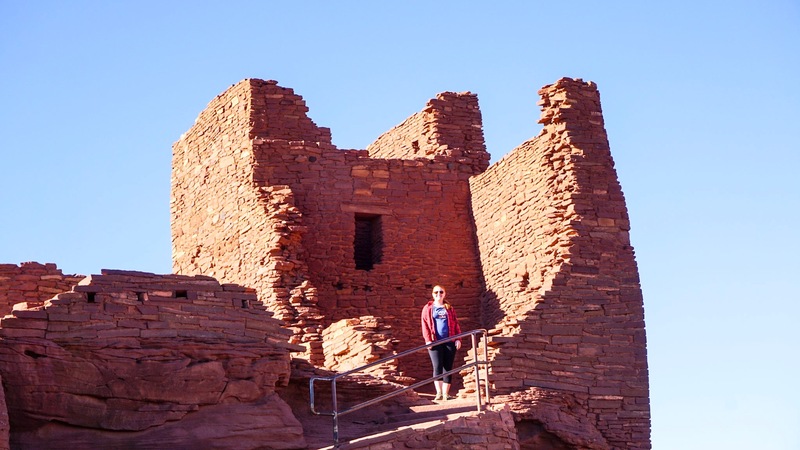 Had we driven to the right canyon the first time it would have been a short day and we wouldn’t have seen all of the amazing native ruins. I think adventure is just what happens when you make a wrong turn (or have literally no idea where you’re going). And even though Brandon had literally no idea where we were going on day 2, I’ll still say that he’s got a two for two winning streak as a tour guide.